The communication team of The New York Times (NYT) has responded directly on Twitter to Cuban leader Miguel Diaz-Canel, who tried to deny the investigation that ensures that Cuban doctors were used in Venezuela to obtain votes for Chavez. "Our story is based on interviews with 16 members of the Cuban medical missions in Venezuela, who described a system of political manipulation in which their services were used to obtain votes for the ruling party," he tweeted the media's communication account. American with screenshots of the report. The NYT also affirmed that they support its history. "This type of rigorous journalism is the core of our work," he added about the report published on March 17 by journalist Nicholas Casey. 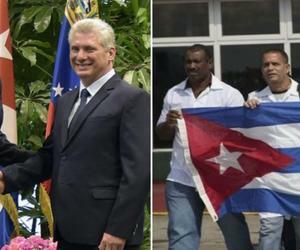 Diaz-Canel tweeted on Tuesday that "Cuban doctors can never be defamed." The "extraordinary human work in lands that the empire calls" dark corners of the world, belie the NYT and its reporter Casey, "he said. However, the testimonies of Cuban health specialists -anonymous for fear of reprisals from the government of the island and Venezuela- reveal the opposite. "It was difficult with Chavez, but with Maduro, from 2013 onwards, this got worse. That is the way to blackmail them: 'you will not have more medicines, you will not have more free health, you will not have more access to prenatal care if you are pregnant,' "said one of them to the NYT. Diaz-Canel also raised that the NYT only seeks with that story "feed the war of hate" of the Cuban-American senator Marco Rubio "against Cuba and Venezuela". According to him, "it's a crime." From the Cuban state media also try to deny the report of the American newspaper, where it was revealed that some doctors on the island came to receive "false voting cards to participate in an election" and manipulate the elderly, "whose diseases made them susceptible to manipulation. " Cuban doctors, meanwhile, are one of the main export assets of the Cuban state economy. After the withdrawal of their specialists from the Mais Médicos in Brazil mission, some denounced that they were treated as slaves and paid very little, a situation that is also repeated in Venezuela. Cuba is one of the countries that supports the dictatorship of Nicolás Maduro in Venezuela, after the National Assembly ignored the second term of the Chavez leader on January 23 and appointed Juan Guaidó as interim president. From Havana and the environment of Maduro insist that the also president of the National Assembly of Venezuela participates in a plot by the United States to end the Chavez project in Venezuela. Despite this strategy followed by other similar countries such as Russia, China or Bolivia, Guaidó is recognized by more than 50 countries as the legitimate representative in Venezuela.